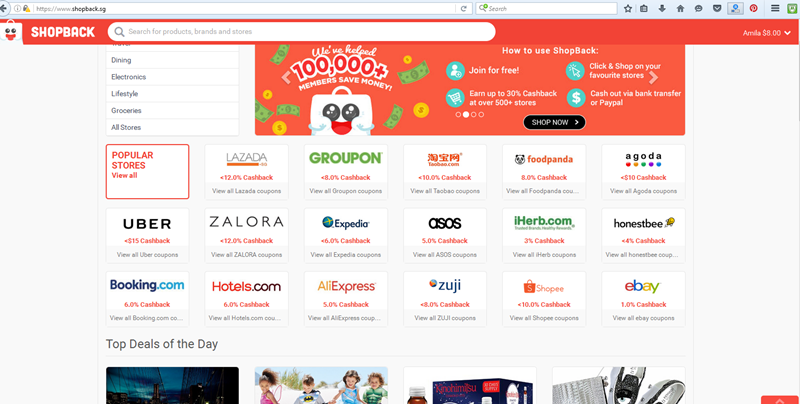 Deals, Cashback and Online Shopping Discounts at ShopBack! I love online shopping. And I love my recent experience with ShopBack Singapore! Online shopping is always convenient and there are also many opportunities to save money while shop. One of the reasons I love online shopping is that I am able to check many items, designs and styles within short period of time when I shop online. But if I visit a local shop for all these things, I need many days to buy a single dress or any small item. I am sure you also have the same experience. Well, now you know why I love online shopping so much. If you notice, through this blog I always share online shopping deals and sites which you can shop products for your family. So, now it is time to share my recent experience with ShopBack Singapore! Most probably you may have heard of ShopBack! ShopBack is a Singapore based e-commerce platform which online shoppers are able to get cashback for their shopping activities. Isn’t this good to introduce to your online shopping experience? Other than saving money on products and saving time on shopping, now you can also experience cashback savings when you shop online through ShopBack Singapore. Is this sound bit confusing? Let me explain the steps of how you can save money through cashback offers when you shop via ShopBack Singapore. It is easier than you think! How to use ShopBack Singapore for cashback and online shopping discounts? Once you are a member of ShopBack, it is time to start shopping. Now, this is the trick. 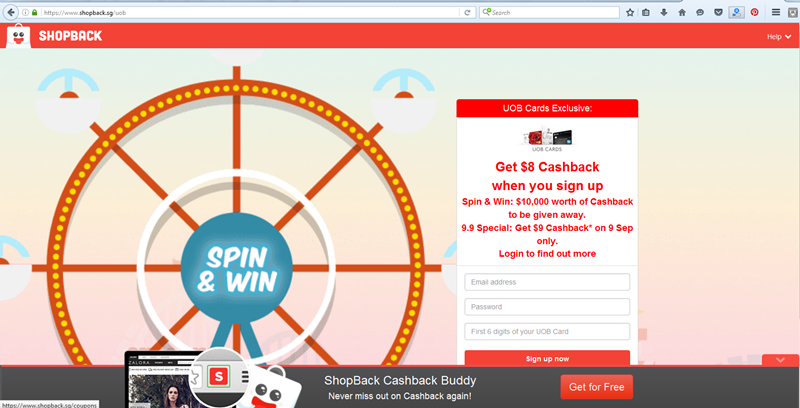 To get cashback, you need to shop through the links shared at ShopBack Singapore site. It is nothing serious. Once you sign up with ShopBack, you will see all your favourite popular online stores are in their list. Select your preferred store and shop as usual. That is it. At the end of your transaction, you will receive a portion of the amount you shopped online. For example, if you want to shop at Guardian or Groupon you can shop through the links shared at ShopBack site where do also provide information on promotions and deals. You can also book hotel rooms through your ShopBack account because almost all the popular online services and shops are working with ShopBack. I usually book hotel rooms through Agoda, but I never get any privelege other than competitive room rates. But, now with ShopBack, I have the opportunity to receive cashback up to $10 when I book hotel rooms. Isn’t this sound good? Do you know, Honestbee is also there in ShopBack Singapore? That is something I really love! 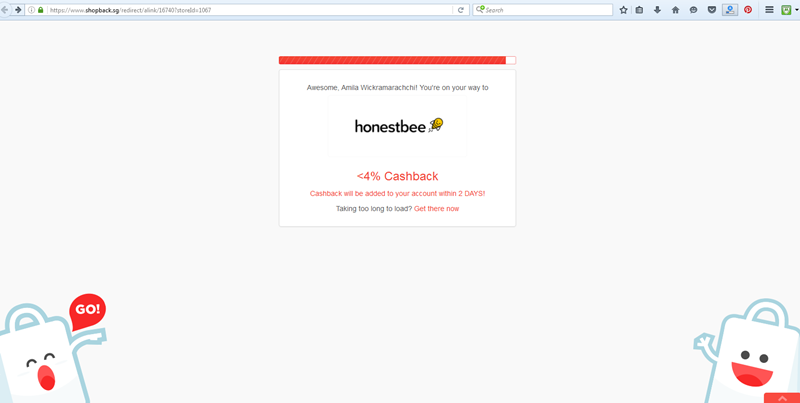 Not only online grocery shopping is easier with Honestbee, I can easily earn cashback for each my Honestbee shopping transaction when I make those through ShopBack. Isn’t this really sound good when you think of transport cost, time and sometimes frustration when we shop by one shop to other shop? Sometimes, carrying kids and feeding them on the way? Most of my favourite shops are in the ShopBack list. 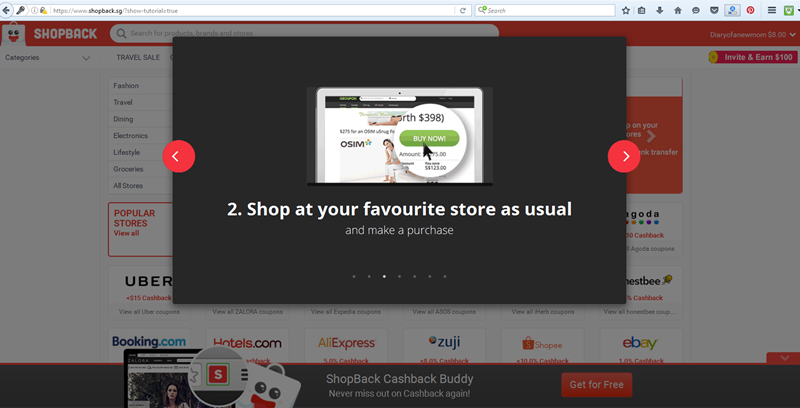 So, I can easily earn cashback rewards for my usual shopping when I do those through ShopBack. My experience with ShopBack Singapore is so far so good. At the moment I signed up using the UOB voucher I received, my account was credited with promised $8 sign up bonus. I also received the message with $5 bonus for my first purchase. 🙂 And when I shop with my favourite stores, I will receive the cashback which allow me to save from my usual expenses. 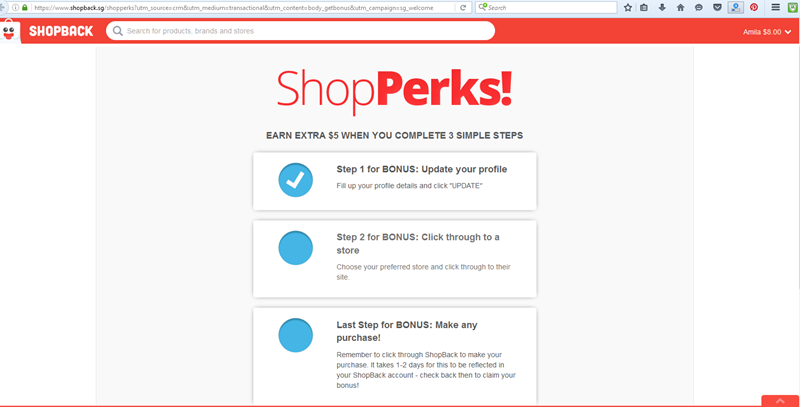 Other than the signup bonus,I am also eligible for another $5 when I make my first purchase with ShopBack. Doesn’t this sound great to save some money for our online activities? As moms, I believe in saving money in the smart ways without lowering our lifestyle. This is one of the best methods to save money without following strict budget rules which make life hard. Stay relaxed and save money when you shop online. To start click here to find some coupons so you can and sign up with ShopBack Singapore right now and start your shopping journey!